Q: Why is there no PCI on the Q60? A: Although the abstention from PCI looks old-fashioned or like a simplification of hardware design, the reasons for the decision to use ISA extensions are on the software side. Above all, the Q60 is made for QL operating systems. In the QL software area, there is a severe lack of development resources. So the choice of hardware has to provide a realistic chance that the required driver software can be written in the foreseeable future. The ISA standard is sufficiently simple to offer this chance - PCI is not. Don't worry too much about the availabilty of ISA cards - we still used IO cards and network cards from ongoing production. If production of ISA cards ends, a market of stock items still remains. Please note that the speed limitations of the ISA bus do not at all affect speed-critical parts (like graphics) on the Q60. Q: Why is there no USB on the Q60? A: The answer is similar to the PCI question. Due to the complexity, we currently see no realistic chance of QL software drivers for USB. Instead of USB, we favour ethernet, which becomes increasingly attractive for peripheral devices. More and more printers, scanners and modems use ethernet. The low-level range of devices like keyboard and mouse is also available with DIN / PS2 / serial interfaces. Q: Isn't it too restrictive to have only 2 extension slots onboard? A: This is a matter of perspective. 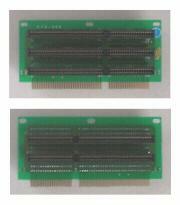 On the original QL, the only extension slot is usually covered by a CPU/memory upgrade like the SuperGoldCard, so most QL had no free extension bus at all, unless a bus expander was used. Compared to that, the Q60 is quite comfortable, especially as it already includes most extensions that needed to be added to a QL. Admittedly, the appearance of Linux, with software support for more ISA cards has turned the small number of 2 onboard extension slots into a limitation. Q: Can I use more than 2 ISA cards with the Q60? A: Yes. Electrically this is no problem, the Q60 can drive up to 5 ISA cards. Any passive ISA slot riser or slot expander, will work. An example is shown below. The problem is, that one has to be creative to find a case with ISA slot riser, which are sometimes available on the second hand market. A customized solution for the Q60 would be fine, help is welcome. Q: Why does the Q60 not fit into the original QL case like the GoldCard, SuperGoldCard and Aurora boards? A: The usage of harddisks, floppies and external keyboards is hardly possible with the original QL case. Consequently, most QL users migrated to other cases, e.g. MiniTower, for their frequently used QL setup. Often a lot of tinkering was required to mount original QL equipmentment into such cases. So the Q60 was designed to fit directly into industry standard AT or ATX form factor cases. An AT case is the better choice for Q60, since the Q60 has a DIN keyboard connector and does not provide a signal for ATX power management. Q: I have mounted my Q60 in an ATX case, but it won't power up. What's wrong? A: Most ATX power supplies require a signal on pin 14 of the main power connector to start. Since the Q60 is supplied by a drive power connector, it can not provide this signal to the ATX power supply. You can connect Pin 14 and 15 of the ATX main power connector to permanently provide this signal. (Unplug the power cord from the supply before you make this modification.) Please note that "soft" powerdown won't work this way. Make sure that your ATX power supply has a "hard" power switch that really disconnects it from the power, or use an external switch.